As you know, I’m a proponent of stricter gun-control laws and would never buy a gun for self-protection. I’ve just seen and heard of too many incidents where guns purchased for protection end up killing family members or innocent people, like Trayvon Martin in the infamous Florida case. But I have to admit it was heartening to see that a Good Samaritan with a gun was able to shoot and kill a 28-year-old robber outside a Shawnee Wal-Mart Sunday afternoon. Below is a photo of the 28-year-old robber, John W. Simmons III of Kansas City. Unfortunately, a second Good Samaritan who did not have a gun was shot several times and seriously wounded. The Star reported that the second Good Samaritan, a 33-year-old Kansas City man, underwent surgery Sunday night. Let’s hope and pray he makes a full recovery…and God bless him for his courage and willingness to step into an awful situation. 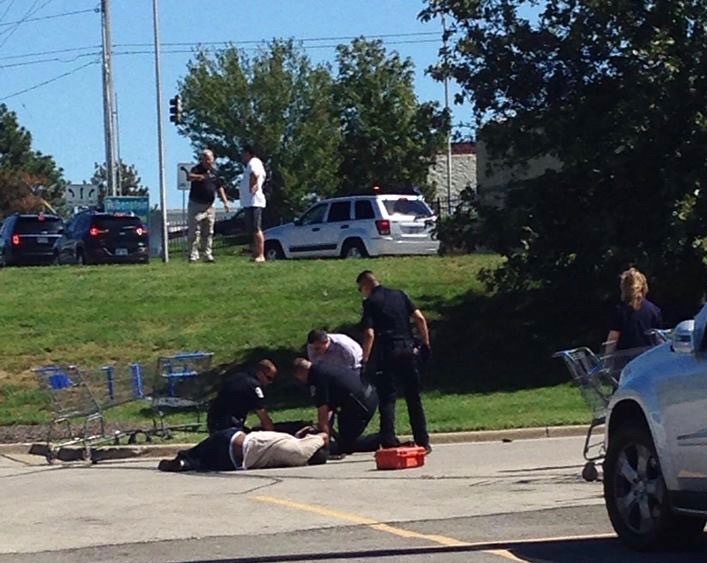 It all started about 1:30 p.m. at the Wal-Mart near Shawnee Mission Parkway and Maurer Road. Two men — one of them apparently Simmons — attacked a 39-year-old KCK woman as she was putting her infant in a car seat after leaving the store. One of the suspects struck her on the head. After hearing her scream, the first Good Samaritan — the unarmed one — moved forward to assist her. One of the assailants then shot him. At that point, the armed Good Samaritan, a 36-year-old De Soto man, came forward and shot one of the attackers, presumably Simmons. The second suspect took off on foot. Police soon apprehended a man but later determined he was not involved. At this writing, the second attacker was being sought. We are seeing a rash of crimes in all parts of the area, including the Westport shootings early Sunday and the recent killing of Julianna Pappas in Overland Park. These cases should serve as a reminder that we cannot take our safety for granted, regardless of where we live or how safe the places we go to might seem to be. I’m usually pretty careful, but it’s easy to become complacent, and I think I have. After this weekend’s upheaval, I’m going to start paying closer attention to what’s going on around me — and who’s around me — when I’m out and about. There are a lot of guns and a lot of desperate people out there. But for today, let’s give credit to Good Samaritan No. 2 and be thankful he was armed and ready in that Shawnee parking lot yesterday. SMH … I hate it that those thriling days of yesteryear and its frontier justice are making a comeback. But I hate it even more that carrying a firearm for self-defense seems to be a wiser idea as each day passes. But, geez, the only weapon I’ve ever fired is an M-16 rifle, and that was 40-odd years ago.. I thank God the good Samaritan (actually, I think his action was more along the tradition of the Lone Ranger) was armed. I applaud the unarmed Samaritan for having the courage to intervene. And if I were the second attacker, I’d surrender to the police immediately, before someone rounds up a posse. I’m sorry for the family of John W. Simmons III. Yes, a bullet killed him, but what laid him to rest was the fatally foolish idea that he’d found an easy mark. Like you, Les, the only time I fired a weapon was in the military. I remember one day when we were firing .45-caliber (I think) pistols, revolvers, whatever, and I aimed at a target about six to eight feet away and…missed! I realized then that handgun rounds could go anywhere. Especially the old 1911 .45 thumb-buster. Moreover the then approved stance –body shifted 45 degrees away from the target and arm straight up from your side (as though one were dueling)– made it harder for inexperienced soldiers to consistently hit a paper target 10 feet away, much less 50 feet. Newer handguns are far more accurate but stats show that most people will still miss at least 4 out 5 shots under 10 feet: adrenaline, fear, unfamiliarity with the situation, these all come into play. I was out of town on a golf trip and missed this story until I returned, but ironically, at the cocktail shed after an enjoyable round of golf and a few enjoyable rounds of frat soda, we had a discussion about gun control and all the hoopla that surrounds it, no matter what position you take. Well, there you go, and it was right here in River City. I tell you golf is (can be!) so relaxing that people who would normally be at each others’ throats can sit down, have a nice post-game discussion, disagree on any number of points and still agree to play again next week. Will — Thanks for providing some information that shows that my aim wasn’t the only problem…I remember how that gun recoiled when I pulled the trigger. About knocked me over! As luck would have it I know at least two of the witnesses, the one who provided the picture and the second an off-duty EMT seen in the picture helping LE provide medical assistance to Samaritan 1. The second perp has been caught and, as one might suspect, he has a lengthy criminal record. Also, as I’m sure others predicted, both perps were black. That said, this was not a case of a couple of white guys riding to rescue the fair damsel from the horrible ghetto dwellers. All of the actors in this one act play are either racial, or ethnic minorities. Both perps, both Samaritans and the victim – heroes, villains – everyone. Samaritan 1 was shot twice, once in the face and once in the chest. From what I’ve been told, had Samaritan 2 not shot the shooter when he did, Samaritan 1 would be dead now. And yes, this is exactly why we passed SB45 and made Kansas a Constitutional Carry state. They will also always seek out the weakest of the weak to prey on. In this case they jumped a woman pre-occupied with her small child. It doesn’t take much of an imagination to figure out that they were intent on hijacking car, woman and child, very likely with the intent of using the child to coerce the woman into following whatever instructions they had in mind. Situations of a good guy with a gun stopping a bad guy with a gun happen almost daily. You usually don’t hear about them because they are not promoted very widely by an industry that is far more sympathetic to pretending they don’t happen. As for marksmanship, civilians have a far better record than LE when it comes to shooting bad guys. I suspect that’s because we understand that every bullet hits something and often something with a lawyer in tow and so we shoot more responsibly than LE who tend to use the classic spray and pray method. An example of this are the two women sitting in a truck in LA that was mistaken for a marauding gunman. To the women’s good fortune, of the over 100 rounds fired at the truck by LE less than 50% successfully even hit the truck (yes, over 50% missed the truck completely) and both women survived. Finally, there is other good news on the self-defense front today and that is that a JOCO judge has thrown out the self-defense claims of the thugs who shot Jon Bieker, co-owner of She’s A Pistol. We can in fact tell the good guys from the bad. “…or innocent people, like Trayvon Martin in the infamous Florida case.” Really? On what planet was he innocent? It was shown that he viciously attacked George Zimmerman, and that Zimmerman, in turn, responded with deadly force. Mr. Zimmerman was acquitted by a jury of his peers, and the DOJ and FBI were not able to even make a case that Trayvon’s civil rights had been violated. Painting Trayvon as an “innocent” victim of gun violence is dishonest at best. Zimmerman purchased a weapon for protection, and used it for its intended purpose.